Jean Santee brings over 25 years of experience to your job! Jean Santee comes from a long line of professional carpenters and building contractors. Among them, the owner/operators of a Portland lumber, paint and hardware company. That “lumber yard” grew to four locations and to include art and decorating supplies, window-, floor- and wall-coverings. 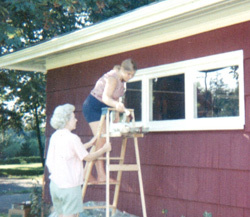 Jean learned to appreciate the beauty of wood and to work with wood finishes from her grandparents, father, aunts and uncles who enjoyed woodworking, remodeling and restoring the finishes in their homes. As an enterprising, hardworking teen, Jean worked in the family business, learning products, applications and outstanding customer service from her uncle Kenneth Santee at Woodland Park Lumber Company in Northeast Portland. She learned the nuts and bolts of the business – literally! Jean continued to build her expertise at Carriage House Paint & Art, the art supply and home decorating segment of the business. She learned custom picture-framing, crafts, and the importance of fine art in creating beautiful, distinctive spaces. Jean has worked for major paint, hardware, home improvement and art wholesale companies throughout Western Washington and Northwest Oregon, from sales associate and supervisor to store manager. 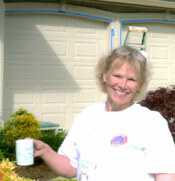 She’s helped contractors and individuals with their painting requirements and challenges. Her credentials include various recognition awards, continuing education, and industry certification. She launched All The Walls in 2005, drawing upon experienced, skilled painters for her team. Some painters may claim to be “the best” but even they come to Jean for advice and solutions because of her experience and helpfulness. Foremost, Jean enjoys people. Her interests include making new friends, traveling, motorcycle outings, boating, gallery art walks, taking afternoon tea, gardening, reading, and enjoying music of all kinds. She brings her positive attitude and sunny disposition to everyday living and to her business. Jean enjoys helping others and being a booster for local organizations and activities . . . and some national ones, too! We are experienced working on the job with other professionals - designers, stagers, contractors, building management, rental agents and realtors . . . without treading on toes.